Have you ever wondered what the big deal with HIT is? We have the answer! Read on to discover the top 12 training guidelines for sensible high intensity weight training! Get the most out of your time at the gym! Now, for many years there has been a need by some to define high intensity training, better known as "H.I.T." When definitions are offered, then there is an added need to re-define, clarify, explain and on and on. So, why is there so much confusion? It seems there are camps in the strength training world that are defined as HIT or non HIT. It's "Us and Them", "Them or Us", why isn't it just strength training? Well, I'll tell you why. For the last few month's I have been reading every certification groups strength and conditioning manuals that I can get my hands on and most of these are "non HIT". The funny thing is that most of these certification courses and manuals don't even agree with each other and one even attacks high intensity training in their certification manual. The truth as I see it with high intensity training is that it evolves. Arthur Jones got the ball rolling when he came up with the "Nautilus Principals." In his writing he often mentioned "high intensity training" or training with a high intensity. The "Nautilus Principles" were guidelines for sensible and safe training. Now the mainstream calls it "HIT." HIT was not a name Arthur used. He just laughs when you mention "HIT." When I was training in Deland in 1970 I didn't know anything about "HIT." I just knew that I was training very hard with little rest and got through much quicker than I was used to. After a time we had new Nautilus machines. At first we used what we had, which was a squat rack, an Olympic set, Universal Machine, and some dumb bells plus one of the first Nautilus Pull Over "upper torso" machine and that was it. Pro, College, and High School coaches from all over the USA came around, along with athletes from many sports both pro and amateur as well as body builders. All showed up in record numbers. What was happening was that this first group was proving Arthur's methods and using what they needed to succeed. A time efficient method had been lacking for implementing most strength programs. From the first coaches came the framework to bring strength training programs into the 20th Century. Different needs featured different parts learned from Arthur and his very extensive research. He made things easy in that respect. He preferred full body routines, trained hard with little rest but far less volume than had been used before. As time has gone on people from the early days have kept the core ideas and shaped them to fit their particular situation. The high intensity training name stuck and someone started calling it HIT, it's pretty darn simple but true. Not everyone does the same things all the time. Some train on just free weights, some only on machines, and some on a mixture of both plus manual resistance and other modalities. Some always go to failure or overload while others feel that in some exercises failure is dangerous, too dangerous to take a chance. Some also cycle their intensity by going to failure at times and others, not. Most that I know have used different ways to vary intensity with failure or overload training being just one way. I use failure when I feel it's appropriate, along with all the other methods I learned from Arthur and the many coaches I have come in contact with. My approach? Well I use a common sense approach. Yes, I know common sense isn't very common, but I try. For those that are really interested in learning about HIT there is an abundance of information available. Arthur was a prolific writer and many others have compiled a wealth of articles and books all on this subject. I don't hold it against anyone that doesn't want to use HIT, and I sure don't think of it as a religion as some have insinuated. So do what you feel is best for your training. Early in my weight training career I was training an average of six days a week. Sometimes twice a day. I was involved in competition in Olympic lifting, power lifting, and bodybuilding. Sometimes there were non-sanctioned Strongman type competitions. At this time I was chemically assisted, but I never felt that it helped. Others did and saw areas of big improvements. But like I said, I never felt it helped and don't recommend it. I was training only three days a week for about 30 to 60 minutes. At first it was mostly on free weights and some machines at Christensen's Health Club, and on mostly free weights and early prototypes of Nautilus Machines in Deland. When I first met Arthur, Nautilus didn't exist in reality. It was only in Arthur's mind. Thus, we didn't have anything special in the beginning to train on. Free weights, Universal machine, Nautilus Pullover Prototype, and that was pretty much it. I was happy to be only training 3 days a week and to me this was "Infrequent Training." Today you have trainers bragging about only working out now and then, or once a month. It has been accepted that this is "Infrequent Training." I believe things have gotten out of hand with this thinking. I feel that 3 days per week is the best way to go for most people. It works for body composition, lean muscle improvements, strength, and conditioning. Most people don't train hard enough to run the risk of over training and three days is not that hard to get in. This can be all weights or a mix of weights and body weight training. Throw in some implements to make things interesting and on your off days get outside and enjoy being active. Don't be afraid to be active. Practice sensible eating and you should do well. This also works, and for very busy people it may be ideal. Also, for the rare few (and I mean few) that train the way we used to in Deland, this is or can be a good frequency of training. Again, you can do all weights or mix with body weight training. It becomes more important to stay active on your non - training days if you are after a "lean look." You can accomplish your goals of adding strength and maintaining muscle by training only 2 days a week. Some will even add muscle but you need to make these workouts count. Focus your training and try to do as much as you can in the space of your workout. Training should take anywhere from 30 to 60 minutes. Some really hard workouts can be completed in 15 minutes and change. In my opinion, when you are training only twice a week, "conditioning" starts to suffer. 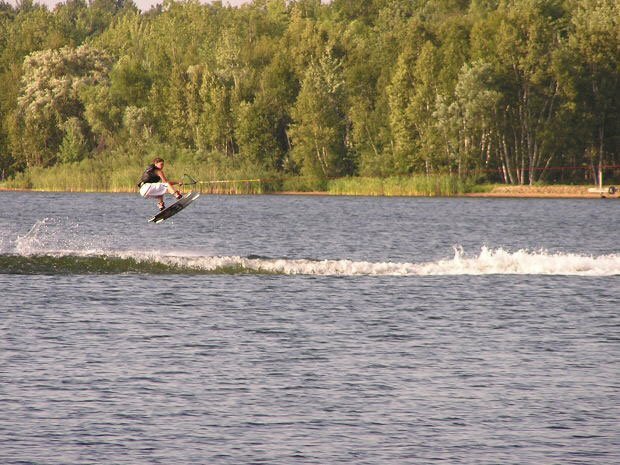 I recommend participating in some kind of outdoor activity, something like jogging, water skiing, swimming, soccer, surfing, boogie boarding, walking, or biking. Get outside, burn some calories, stay fit and stay active. Twice a week can work but you have to practice sensible eating if you want to shed some fat. 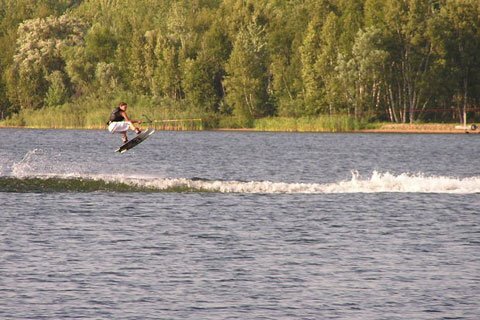 Of Outdoor Activity Such As Water Skiing. I don't find this to be optimal. Sometimes you can't help it. Life gets busy and you can only get one a week in. I feel that you can continue to add strength on one training session a week as long as you really focus on weight progression in your exercises. I feel that body composition suffers for most people. You will tend to get fat and your conditioning will suffer, as well as your "work capacity." You'll really have to cut your calories if you want a lean look. So much so, that you may find you don't have enough energy for a heavy workout. Your strength can suffer also. It's around this area that "Infrequent Training" starts to become too infrequent. You better be active as heck if you only workout once a week or you will become fat. Less than once a week training: Look I'm going to be honest here. I don't care how many books or articles you have that say you can succeed on this. What you will end up with is an unhealthy and undesirable body. You'll have very little muscle, and your conditioning will be zero. You just can not do it in five minutes a day whenever you feel like it as some would have you believe, and you can not do it with workouts that never happen. Having the best Fitness Library means zilch if all you ever do is read and talk about your workout. You have to work out! You have to raise your heart rate. You have to spend some sweat and effort. You have to be consistent. You have to pay attention to what and how much you eat. All the best intentions in the world will not make up for lack of effort in the gym. AND neither will the latest "Fitness Craze." The experts on the Internet will go on and on about "I use this and I use that" but the bottom line is weight training works. Combine weight training with body weight training and conditioning and just do it. It has worked for over 50 years as I know it and continues to work. Gimmicks come and go but sensible strength training will go on and on. BUT you have to show up, work out, and be consistent! Argue less on the Bodybuilding sites and forums and you will probably find the extra few minutes needed to "just go lift." I don't care how you do it or whose method you use, "just go lift." All said and done if you have been training consistently and regularly, don't be afraid to take some time off to recharge now and then. Best effort equals best results. Not everyone will end up developing "Huge Muscles." Some will and some won't. It depends on your potential and effort. And remember, women don't end up looking like a man because they lift weights. So just throw that excuse out the window. Women look good with some lean muscle on them. Perform 1-3 sets of 4-6 exercises for the lower body and 6-8 exercises for the upper body, and not more than 12 exercises in any workout most of the time. Select a resistance for each exercise that allows you to do between 10-15 repetitions. Some may need 15-20 reps. Lower reps may be used at times. Continue each exercise until no additional positive repetitions in good form are possible. When 15 or more repetitions are performed, increase the resistance by approximately 5 % the next workout. Go for overload. Work the largest muscles first and move quickly from one exercise to the next. This procedure develops cardiovascular endurance. Concentrate on flexibility by slowly stretching during the first couple of repetitions of a movement. Don't grip equipment tightly. Accentuate the lowering portion (negative) of each repetition. If the weight stack is banging, you've lost control. Move slower, never faster, if in doubt about the speed of an exercise. Don't move around in equipment while training. Do everything possible to isolate and work each large muscle group to momentary overload. Don't hold your breath! Attempt constantly to increase the number of repetitions or the amount of weight or both. But do not sacrifice form in an attempt to produce results. Train safe! Don't hold your breath! Your goal should be to exceed the last workouts performance, in as many exercises as you can. Train no more than three times a week, Avoid over training! Keep accurate records--date---resistance---repetitions---of each workout. Use any equipment that you have----machines or free weights---- the main point is safety. The muscles do not have brains that tell them if you are using machines or free weights, they only know resistance. The myth that free weights are better than properly developed machines is just that--a myth! Use advanced HIT principles sparingly, such as: breakdowns, pre-exhaust, negative only, negative accentuated, 3X3's, 30's Day, forced reps and more. "HIT is a safe, sensible, and practical approach to strength training and conditioning. Methods vary but so do needs. It is up to the coach or trainee to match them to their situation. HIT is not a "secret training method" that only a select few know. Its use is very wide spread and sources of information abound." "HIT is anything that makes you muscularly larger and stronger due to very hard, focused work on a limited number of exercises, using a limited number of sets, with a controlled and relatively limited training frequency." Dr. Ken. Truth is I don't need a definition. I'm happy with what I do. And I enjoy it too. Is that HIT? Who knows? Train Hard, be safe, and be productive!